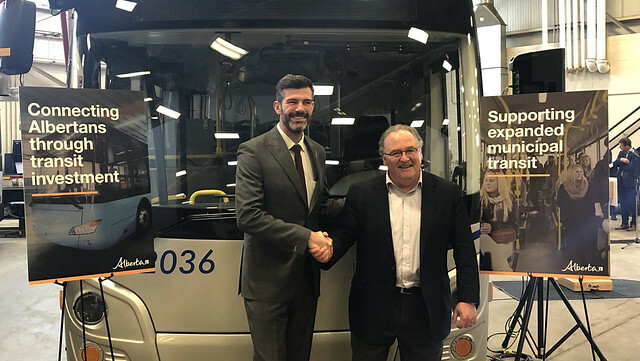 Minister Mason and Mayor Iveson celebrate Alberta Community Transit funding. A total of 17 municipal transit systems will share $215 million from the new Alberta Community Transit Fund, launched in August 2018. Projects include the purchase of 15 new Light Rail Vehicles (LRVs) and 52 Compressed Natural Gas (CNG) buses in Calgary, as well as a dedicated bus lane on Terwillegar Drive and 28 new electric buses in Edmonton. Alberta Community Transit Fund investments help municipalities address the needs of their growing communities, while increasing environmentally sustainable transit options and improving rider experience. In the first three years, the grants will be funded with $141.4 million from the Climate Leadership Plan.